So you want to write a book? Awesome. I’ve been working on one too for the last year. No, it’s not really a programming book, but it does have code in it. It’s a sci-fi/fantasy book written for my ten year daughter, but this post isn’t about that. It’s about sharing the tools and setup that I’ve found work best for me. If the first thing you think of when you want to write a book is creating some really cool tools to help you, I can totally relate. It’s a programmer thing. Hold on though, there’s another way. 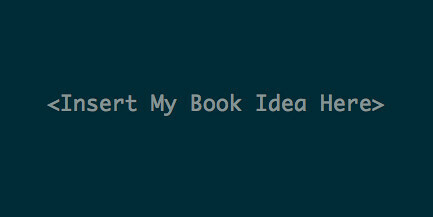 Leanpub is a free service for authoring that has Git integration in Markdown format. With it, I was able to write in my favorite text editor, (Emacs of course), commit and push my changes to my git repo, and then generate PDF and e-book formats. The multiple formats were important to me because it allowed me to share my chapters and get feedback. Since I was writing a book with my daughter in mind, the most important feedback was from her. After every chapter was done. I would either print her out a copy or download it to her Kindle for review. She actually really enjoyed reading it on her Kindle because it made it for more real to her. My son also got interested in the story and before long, I had them both getting in heated debates about which direction the story should go. After my kids reviewed the chapters, I also sought some professional writing advice from a free-lance editor. I highly recommend getting this sort of feedback from an editor, writing group, or trusted friend to help you grow and improve. The one catch is that most of the writing world works with Microsoft Word, so I needed to convert my chapters to that format. From my experience, all PDF to Word converters are full of fail. The formatting goes all over the place and your writing ends up looking like some horrible abstract text art experiment gone wrong. So far, the best converter I’ve found is pandoc. It allows you to take your Markdown files and turn them into quite presentable Word documents. If you have a Mac, it’s as simple as brew install pandoc. Then, you can create a simple script to convert all your chapters,(or a selection) into a properly formatted Word Doc. Once you write your manuscript, (what the publishing world calls your book text), revise it, copy edit it, and walk backwards in a circle three times, you’re ready to publish. I don’t have any real firm advice in this area yet since I’m still in the midst of it, but I’ll share the two options that I’m looking at – traditional publishing and self publishing. Self publishing is more easily understood of the two. You can put your book up for sale at any time through Leanpub or Amazon. For better or worse, you have complete control of the content, display, marketing, and revenue of your book. Traditional publishing involves finding an literary agent and/or publisher to work with. This route involves pitching your manuscript to someone to represent it through a query. The advantages of this are that, (if you find a good match), you will have a team of people helping you make your book the best it can be and have the possibility of getting it on the shelf in a bookstore. One of the downsides is that the traditional publishing world takes a lot longer than pushing the self publish button. With any luck, I’ll have a clearer picture of this all in a bit and be able to share my experiences. In the meantime, I encourage you to grab your keyboard and bring your book ideas to life. No matter the outcome, it’s a rewarding journey.